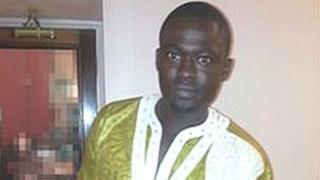 A third man has been arrested in connection with the death of a Gambian national whose body was found in a flat in Edinburgh. Dodou Leigh, 30, was discovered in Hawkhill Close in Leith on 4 December. A 27-year-old was arrested in the Dalry area of the city and is due to appear at Edinburgh Sheriff Court on Wednesday. Two other men, aged 25 and 29, have already appeared in court charged with Mr Leigh's murder.